The past few years, the goal for most smartphone manufacturers, is to differentiate their smartphone offerings through clever design. Some have opted to go for manufacturing the thinnest or lightest smartphone, while some have opted for the most vibrant and most responsive touchscreen display. Apple, Samsung and LG, being one of the industry’s bigwigs, is no stranger to this approach. And so does Oppo, one of China’s up and coming smartphone startups. Not quite the stranger to great product design, having produced the 4.8mm thin Oppo R5 and the swiveling camera of the N3, Oppo is at it once again, this time with the handset people are unofficially branding as the Oppo R7. This time though, Oppo is gunning for the smartphone bezel. Or, the lack thereof. Leaks first surfaced as early as March, with Chinese tech site MyDrivers sharing two images of what seem to be a new Oppo smartphone with an edge-to-edge screen, just like the Sharp Aquos Crystal launched last year. Contrary to Sharp however, Oppo aims to feature ultra-thin bezels on the lateral edges, as opposed to Sharp’s seemingly invisible bezels at the top and bottom of the device. With its metallic frame and thin profile, speculators all over the web think that this will be the successor to the Find 7 launched last year. In a separate post, GSMArena also reported a patent submission by Oppo in China that details a method on how to create the effect of a bezel-less display. The schematic, shown below, details how a glass beveled in the side can refract light, which in turn creates the illusion that the screen is much larger than it actually is, thus concealing the phone’s margins. It’s a neat trick, although not exactly new, as Sharp (mentioned earlier) and even Xiaomi has done the same to make the bezel illusion. Other leaked pictures appeared last week, although no other information were available. 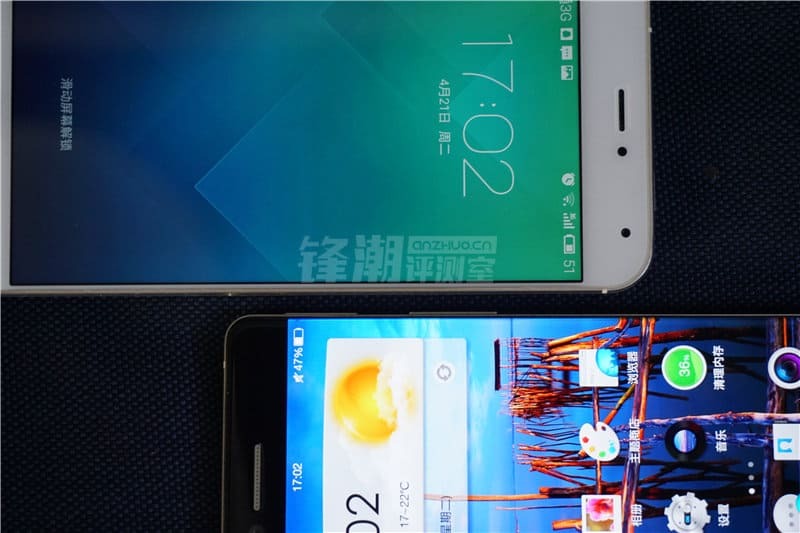 A few previous unverifiable rumors though suggest that the Oppo R7 will sport a 5.5inch display, a 64-bit octa-core MediaTek MT6795 processor, a 20.7MP rear-facing camera and will measure just 4.85mm thick. Finally, there is this new leaked video. The original one is three-minutes long and highlights the phone’s user interface, chassis, and some of the technology that made the bezel-less look possible. Problem though, is that it is hosted in a Chinese video sharing website and we can’t figure out how to share the damn thing. Embedded below is the next big thing though, as a Youtube user posted a part of the clip. Of course, as with any other tech rumor, everything we know with the Oppo R7, even if this handset will actually be named as such, should be taken with a grain of salt. Nevertheless, it is quite nice to know these, especially if you are an Oppo fan dying to know what the company has been up to lately. Will the Oppo R7 be worth it? Personally, I have serious issues about the usability of the device. Historically, thin bezels have been found to be quite difficult to navigate, especially with people with smaller hands. Nevertheless, the Oppo R7 is a nice manifestation of the company’s engineering prowess and is surely a head-turner. So what do you think guys? Be sure to share your thoughts with us in the comments section below.